The new 7-14 lens filter adapter from Phil Norton Photography has been developed specifically to provide a solution to allow the use of filters with the Olympus m.Zuiko 7-14mm Pro lens. Please note - The 7-14 Adapter is compatible with the Nisi v5 Pro and also fully compatible with the new Nisi V6 Filter Holder. With the introduction of Super Wide Angle 14mm lenses from Canon and Nikon, Olympus released their version in 2015, the Olympus m.Zuiko 7-14mm f2.8 Pro. This premium lens has an ultra wide field of view, metal weather sealed construction, class leading optics and resolution worth of a “Pro” label. However the convex design of the front element and the necessary built in lens hood prevents having a lens thread and therefore the use of filters. Filters are one of the most important accessories to a landscape photographer for controlling and extending exposure. A number of filter holders are now available from manufacturers including Nisi based on 150mm wide filters, which are far too big and cumbersome for the small Olympus 7-14mm Pro. The logical conclusion was to develop an adapter based on the more comprehensive and popular 100x150mm filters. The 7-14 Pro Adapter has been carefully modeled using 3D software and prototyped through various stages using 3D printing technology. It is designed to accept the Nisi V5 and V5 Pro filter holder to benefit from the quality of the Nisi system, and the quality of Nisi glass filters. Tests with other filter holders showed that vignetting could occur when using two slots at the lens’ widest end, and modified rails with minimal slots could allow light leakage using ND filters and reduce the ability of slots to actually support filters. By producing the adapter to minute tolerances of 0.3mm, the Nisi holder will allow the use of two slots with no vignetting when used vertically and minimal vignetting when angled. When there is a need to angle a filter, setting the lens to 7.5mm will remove vignetting. When purchasing the 7-14 Adapter and the Nisi V5 Pro holder, the holder is shipped with the full kit as shown on the Nisi Filters page, complete with adapter, step rings and polariser. Although the main Nisi adapter and therefore the included polariser can not be used with the 7-14 Pro, it provides the ideal kit to us on all other lenses, complete with a polariser that does not have to have a holder fitted to use. For extra security a sliding security plate is supplied with the Adapter which is fitted to the rear of the V5 Pro holder. This covers the join opposite the lock pin to ensure the holder cannot accidentally dislodge from the Adapter. When using the Nisi v5 Pro Adapter on other lenses simply leave the Plate in the 'open' position. When purchasing the v5 Pro and Adapter together it will be supplied ready to use. Please see the V5 Pro Mod page for instructions. 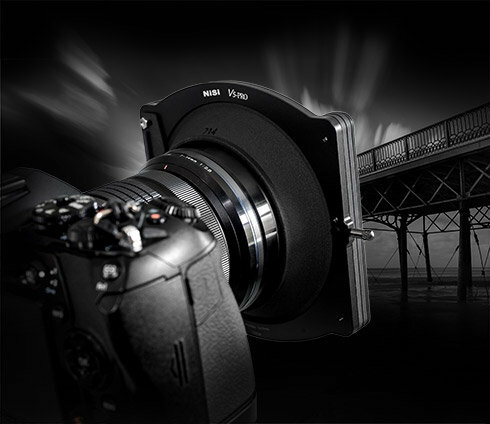 To use the Nisi v5 Pro holder with other Olympus lenses, simply use additional step rings supplied with the v5 holder. Please note a 62mm ring is not included but can be supplied. Having the ability to use the Nisi V5 Pro filter holder with the Olympus 7-14mm Pro opens up a new world of creative opportunities for the serious photographer, and means one system can be used across all lenses, reducing valuable kit bag space and cost. Please see the 7-14 Adapter Details page for more information. Please see the link v5 Pro Mods if you did not purchase the holder and the Adapter together and need instructions for the modifications. New - The New Nisi V5 Pro is compatible with the 7-14 Adapter and offers significantly better performance with vignetting than the V5 due to new rail design. or visit the Nisi Filters page.